37 CFR 1.98 Content of information disclosure statement. Third parties (individuals not covered by 37 CFR 1.56(c)) cannot file information disclosure statements under 37 CFR 1.97 and 37 CFR 1.98. Third parties may only submit patents and publications in compliance with 37 CFR 1.290 in applications published under 35 U.S.C. 122(b). See MPEP § 1134.01. For unpublished, pending applications, any member of the public, including private persons, corporate entities, and government agencies, may file a protest under 37 CFR 1.291 prior to the mailing of a notice of allowance under 37 CFR 1.311. See MPEP Chapter 1900. Alternatively, third parties may provide information to the applicant who may submit the information to the Office in an IDS. See 37 CFR 1.56(d). The Office will review any submission in an application filed by a third party to determine whether the submission is in compliance with 37 CFR 1.290 or 1.291. Any third party submission that does not comply with the requirements of 37 CFR 1.290 or 37 CFR 1.291 will not be entered into the application file and will be discarded. 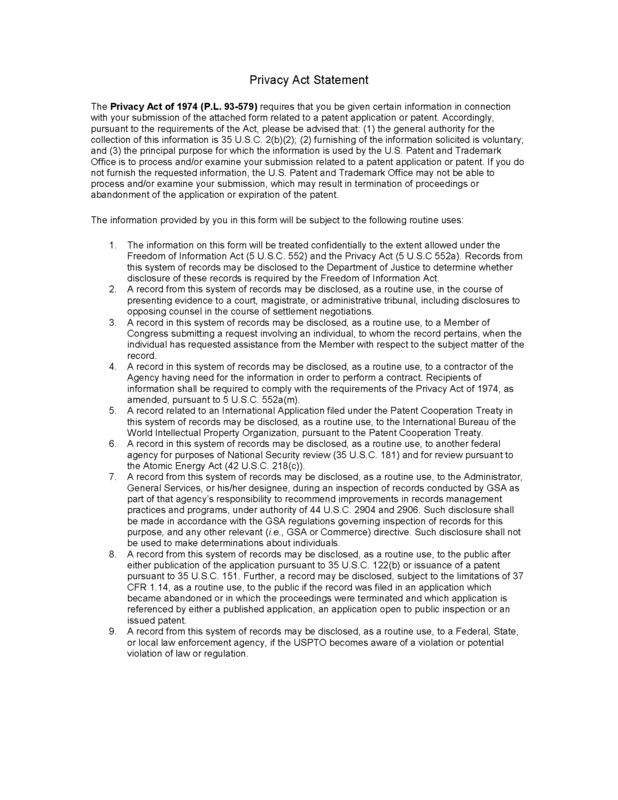 Office personnel (including the Patent Examining Corps) are instructed to: (1) not reply to or act upon any third-party inquiry or other submission in an application, except those in compliance with 37 CFR 1.290 or 37 CFR 1.291; and (2) decline to accept oral or telephone comments or submissions about applications from third parties. See MPEP § 1134.01. Once the minimum requirements of 37 CFR 1.97 and 37 CFR 1.98 are met, the examiner has an obligation to consider the information. There is no requirement that the information must be prior art references in order to be considered by the examiner. Consideration by the examiner of the information submitted in an IDS means nothing more than considering the documents in the same manner as other documents in Office search files are considered by the examiner while conducting a search of the prior art in a proper field of search. The initials of the examiner placed adjacent to the citations on the PTO/SB/08A and 08B or its equivalent mean that the information has been considered by the examiner to the extent noted above. In addition, the following alternative electronic signature method may be used by examiners in information disclosure statements to indicate whether the information has been considered. Examiners will no longer initial each reference citation considered, but will continue to strikethrough each citation not considered. Each page of reference citations will be stamped by the examiner with the phrase “All references considered except where lined through” along with the examiner’s electronic initials, and the final page of reference citations will include the examiner’s electronic signature. Information submitted to the Office that does not comply with the requirements of 37 CFR 1.97 and 37 CFR 1.98 will not be considered by the Office but will be placed in the application file. Multiple information disclosure statements may be filed in a single application, and they will be considered, provided each is in compliance with the appropriate requirements of 37 CFR 1.97 and 37 CFR 1.98. Use of form PTO/SB/08A and 08B, “Information Disclosure Statement,” is encouraged as a means to provide the required list of information as set forth in 37 CFR 1.98(a)(1). Applicants are encouraged to use the USPTO form PTO/SB/08A and 08B when preparing an information disclosure statement because this form is updated by the Office. The form PTO/SB/08A and 08B will enable applicants to comply with the requirement to list each item of information being submitted and to provide the Office with a uniform listing of citations and with a ready way to indicate that the information has been considered. A copy of form PTO/SB/08A and 08B is reproduced at the end of this section. (A) All the time-related requirements of 37 CFR 1.97, which are based on the time of the filing of the IDS. See MPEP § 609.04(b) for more information. (2) After (1) but before final action, notice of allowance, or Quayle action 1.97(e) statement or 1.17(p) fee. (3) After (2) and before (or with) payment of issue fee. 1.97(e) statement, and 1.17(p) fee. (4) After payment of issue fee. IDS will not be considered. (B) All content requirements of 37 CFR 1.98. See MPEP § 609.04(a) for more information. (v) Non-patent literature cited by publisher, author (if any), title, relevant pages, and date and place of publication. (e) All other cited information or the portion which caused it to be listed. (b) A written English language translation of a non-English language document, or portion thereof, if it is within the possession, custody or control of, or is readily available to any individual designated in 37 CFR 1.56(c). (A) Consider the information properly submitted in an IDS in the same manner that the examiner considers other documents in Office search files while conducting a search of the prior art in a proper field of search. (1) For e-IDS, use the e-IDS icon on examiner’s workstation to consider cited U.S. patents and U.S. patent application publications. See MPEP § 609.07 for more information on e-IDS. (2) Initial the blank column next to the citation to indicate that the information has been considered by the examiner, or use the alternative electronic signature method by inserting on each page of reference citations the phrase “All references considered except where lined through” along with the examiner’s electronic initials, and providing the examiner’s electronic signature on the final page of reference citations. (B) Draw a line through the citation to show that it has not been considered if the citation fails to comply with all the requirements of 37 CFR 1.97 and 37 CFR 1.98. The examiner should inform applicant the reasons why a citation was not considered. (C) Write “not considered” on an information disclosure statement if none of the information listed complies with the requirements of 37 CFR 1.97 and 37 CFR 1.98. The examiner will inform applicant the reasons why the IDS was not considered by using form paragraphs 6.49 through 6.49.10. (D) Sign and date the bottom of the IDS listing, or use the alternative electronic signature method noted in item (A)(2) above. (E) Ensure that a copy of the IDS listing that is signed and dated by the examiner is entered into the file and mailed to applicant. For discussion of electronic processing of IDS, see MPEP § 609.08. When filing a continuing application that claims benefit under 35 U.S.C. 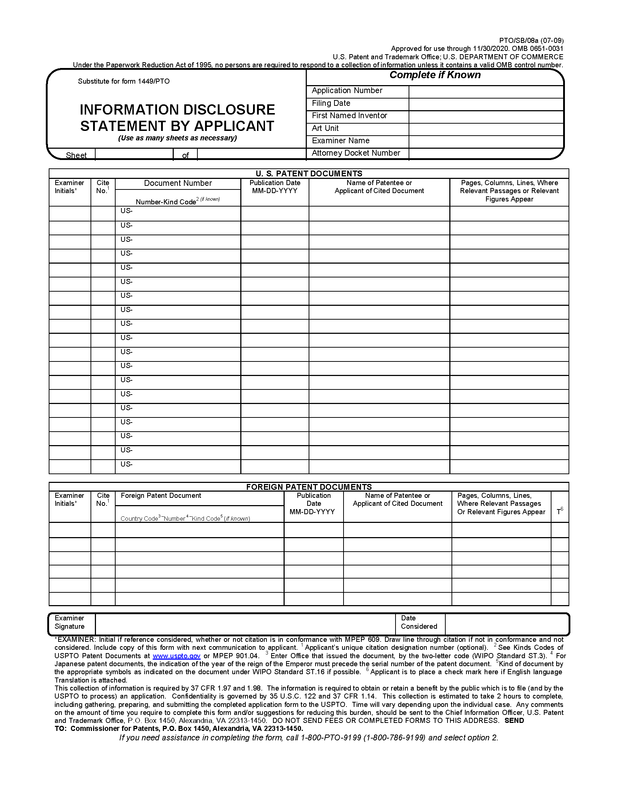 120 to a parent application (other than an international application that designated the U.S.), it will not be necessary for the applicant to submit an information disclosure statement in the continuing application that lists the prior art cited by the examiner in the parent application unless the applicant desires the information to be printed on the patent issuing from the continuing application (for continued prosecution applications filed under 37 CFR 1.53(d), see subsection A.1. below). The examiner of the continuing application will consider information which has been considered by the Office in the parent application. When filing a continuing application that claims benefit under 35 U.S.C. 120 to an international application that designated the U.S. (see MPEP § 1895), it will be necessary for the applicant to submit an information disclosure statement complying with 37 CFR 1.97 and 1.98 in the continuing application listing the documents cited in the international search report and/or the international preliminary examination report of the international application if applicant wishes to ensure that the information is considered by the examiner in the continuing application. See MPEP § 609.03 for consideration of documents cited in the international search report in a PCT national stage application. 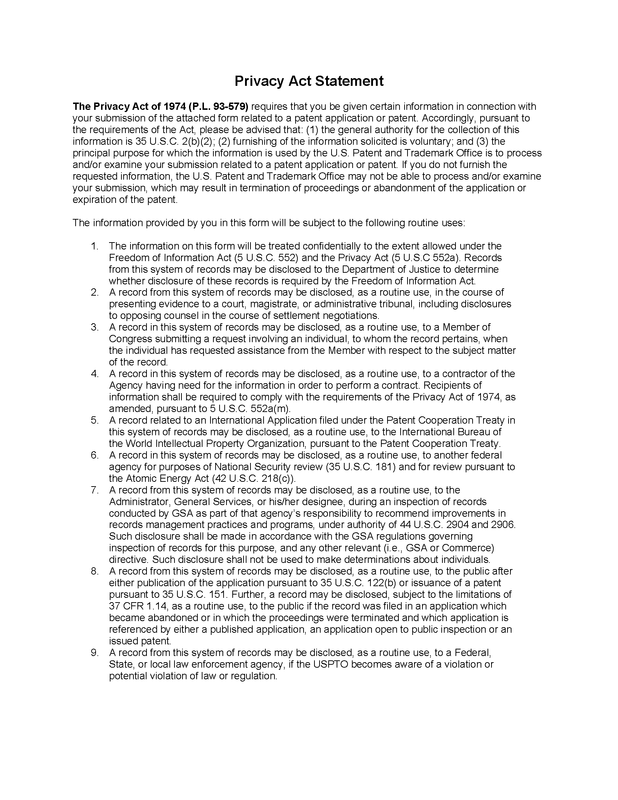 Information which has been considered by the Office in the parent application of a continued prosecution application (CPA) filed under 37 CFR 1.53(d) will be part of the file before the examiner and need not be resubmitted in the continuing application to have the information considered and listed on the patent. The examiner will consider information which has been considered by the Office in a parent application (other than an international application; see subsection I., above) when examining: (A) a continuation application filed under 37 CFR 1.53(b), (B) a divisional application filed under 37 CFR 1.53(b), or (C) a continuation-in-part application filed under 37 CFR 1.53(b). A listing of the information need not be resubmitted in the continuing application unless the applicant desires the information to be printed on the patent. If resubmitting a listing of the information, applicant should submit a new listing that complies with the format requirements in 37 CFR 1.98(a)(1) and the timing requirements of 37 CFR 1.97. Applicants are strongly discouraged from submitting a list that includes copies of PTO/SB/08 or PTO-892 forms from other applications. A completed PTO/SB/08 form from another application may already have initials of an examiner and the application number of another application. This information will likely confuse the record. Furthermore, when the spaces provided on the form have initials of an examiner, there are no spaces available next to the documents listed for the examiner of the subsequent application to provide his or her initials, and the previously relevant initials may be erroneously construed as being applied for the current application. Information which has been considered by the Office in the application before the filing of a RCE will be part of the file before the examiner and need not be resubmitted to have the information considered by the examiner and listed on the patent. Information filed in the parent application that complies with the content requirements of 37 CFR 1.98 will be considered by the examiner in the CPA. No specific request from the applicant that the previously submitted information be considered by the examiner is required. For these types of applications, in order to ensure consideration of information previously submitted, but not considered, in a parent application, applicant must resubmit the information in the continuing application in compliance with 37 CFR 1.97 and 37 CFR 1.98. Pursuant to 37 CFR 1.98(d), if the IDS submitted in the parent application complies with 37 CFR 1.98(a) to (c), copies of the patents, publications, pending U.S. applications, or other information submitted in the parent application need not be resubmitted in the continuing application. When resubmitting a listing of the information, applicant should submit a new listing that complies with the format requirements in 37 CFR 1.98(a)(1). Applicants are strongly discouraged from submitting a list that includes copies of PTO/SB/08 or PTO-892 forms from other applications. A PTO/SB/08 form from another application may already have the application number of another application. This information will likely confuse the record. Information filed in the application in compliance with the content requirements of 37 CFR 1.98 before the filing of a RCE will be considered by the examiner after the filing of the RCE. For example, an applicant filed an IDS in compliance with 37 CFR 1.98 after the mailing of a final Office action, but the IDS did not comply with the requirements of 37 CFR 1.97(d)(1) and (d)(2) and therefore, the IDS was not considered by the examiner. After applicant files a RCE, the examiner will consider the IDS filed prior to the filing of the RCE. For more details on RCE, see MPEP § 706.07(h). The examiner will consider the documents cited in the international search report in a PCT national stage application when the Form PCT/DO/EO/903 indicates that both the international search report and the copies of the documents are present in the national stage file. In such a case, the examiner should consider the documents from the international search report and indicate by a statement in the first Office action that the information has been considered. There is no requirement that the examiner list the documents on a PTO-892 form. The references cited in the PCT international search report by the  have been considered, but will not be listed on any patent resulting from this application because they were not provided on a separate list in compliance with 37 CFR 1.98(a)(1). In order to have the references printed on such resulting patent, a separate listing, preferably on a PTO/SB/08A and 08B form, must be filed within the set period for reply to this Office action. 1. In bracket , identify the office (e.g., JPO, EPO, etc.) that issued the international search report and the date it issued. 2. This form paragraph may be used for national stage applications under 35 U.S.C. 371 where the examiner has obtained copies of the cited references or where copies of such references are not required under 37 CFR 1.98. If receipt of copies of references required under 37 CFR 1.98 is not indicated on the PCT/DO/EO/903 form in the file, burden is on the applicant to supply such copies for consideration. See MPEP § 1893.03(g). 3. Instead of using this form paragraph, the examiner may list the references on a PTO-892, thereby notifying the applicant that the references have been considered and will be printed on any patent resulting from this application. 4. This form paragraph should only be used prior to allowance when a statutory period for reply is being set in the Office action. 5. If the application is being allowed, form paragraph 6.54 should be used with the Notice of Allowability instead of this form paragraph. The references cited in the PCT international search report by the  have been considered, but will not be listed on any patent resulting from this application because they were not provided on a separate list in compliance with 37 CFR 1.98(a)(1). In order to have the references printed on such resulting patent, a separate listing, preferably on a PTO/SB/08A and 08B form, must be filed within ONE MONTH of the mailing date of this communication. NO EXTENSION OF TIME WILL BE GRANTED UNDER EITHER 37 CFR 1.136(a) OR (b) to comply with this requirement. The listing of references in the PCT international search report is not considered to be an information disclosure statement (IDS) complying with 37 CFR 1.98. 37 CFR 1.98(a)(2) requires a legible copy of: (1) each foreign patent; (2) each publication or that portion which caused it to be listed; (3) for each cited pending U.S. application, the application specification including claims, and any drawing of the application, or that portion of the application which caused it to be listed including any claims directed to that portion, unless the cited pending U.S. application is stored in the Image File Wrapper (IFW) system; and (4) all other information, or that portion which caused it to be listed. In addition, each IDS must include a list of all patents, publications, applications, or other information submitted for consideration by the Office (see 37 CFR 1.98(a)(1) and (b)), and MPEP § 609.04(a), subsection I. states, “the list ... must be submitted on a separate paper.” Therefore, the references cited in the international search report have not been considered. Applicant is advised that the date of submission of any item of information or any missing element(s) will be the date of submission for purposes of determining compliance with the requirements based on the time of filing the IDS, including all “statement” requirements of 37 CFR 1.97(e). See MPEP § 609.05(a). 1. This form paragraph may be used in national stage applications under 35 U.S.C. 371. 2. Do not use this form paragraph when the missing references are U.S. patents, U.S. patent application publications, or U.S. pending applications that are stored in IFW. 37 CFR 1.98(a)(1) also requires that each page of the list include a heading that clearly indicates that the list is an IDS. Since the Office treats an IDS submitted by the applicant differently than information submitted by a third-party (e.g., the Office may discard any non-compliant third-party submission under 37 CFR 1.99), a heading on each page of the list to indicate that the list is an IDS would promote proper treatment of the IDS submitted by the applicant and reduce handling errors. Second, 37 CFR 1.98(c) states that when the disclosures of two or more patents or publications listed in an information disclosure statement are substantively cumulative, a copy of one of the patents or publications may be submitted without copies of the other patents or publications provided that a statement is made that these other patents or publications are cumulative. The examiner will then consider only the patent or publication of which a copy is submitted and will so indicate on the list, form PTO/SB/08A and 08B, submitted, e.g., by crossing out the listing of the cumulative information. But see Semiconductor Energy Laboratory Co. v. Samsung Electronics Co., 204 F.3d 1368, 1374, 54 USPQ2d 1001, 1005 (Fed. Cir. 2000) (Reference was not cumulative since it contained a more complete combination of the claimed elements than any other reference before the examiner. “A withheld reference may be highly material when it discloses a more complete combination of relevant features, even if those features are before the patent examiner in other references.” (citations omitted).). The requirement for a concise explanation of relevance is limited to information that is not in the English language. The explanation required is limited to the relevance as understood by the individual designated in 37 CFR 1.56(c) most knowledgeable about the content of the information at the time the information is submitted to the Office. If a complete translation of the information into English is submitted with the non-English language information, no concise explanation is required. An English-language equivalent application may be submitted to fulfill this requirement if it is, in fact, a translation of a foreign language application being listed in an information disclosure statement. There is no requirement for the translation to be verified. Submission of an English language abstract of a reference may fulfill the requirement for a concise explanation. Where the information listed is not in the English language, but was cited in a search report or other action by a foreign patent office in a counterpart foreign application, the requirement for a concise explanation of relevance can be satisfied by submitting an English-language version of the search report or action which indicates the degree of relevance found by the foreign office. This may be an explanation of which portion of the reference is particularly relevant, to which claims it applies, or merely an “X”, “Y”, or “A” indication on a search report. The requirement for a concise explanation of non-English language information would not be satisfied by a statement that a reference was cited in the prosecution of a United States application which is not relied on under 35 U.S.C. 120. The concise explanation may indicate that a particular figure or paragraph of the patent or publication is relevant to the claimed invention. It might be a simple statement pointing to similarities between the item of information and the claimed invention. It is permissible but not necessary to discuss differences between the cited information and the claims. However, see Semiconductor Energy Laboratory Co. v. Samsung Electronics Co., 204 F.3d 1368, 1376, 54 USPQ2d 1001, 1007 (Fed. Cir. 2000) (“[A]lthough MPEP Section 609A(3) allows the applicant some discretion in the manner in which it phrases its concise explanation, it nowhere authorizes the applicant to intentionally omit altogether key teachings of the reference.”). In Semiconductor Energy Laboratory, patentee during prosecution submitted an untranslated 29-page Japanese reference as well as a concise explanation of its relevance and an existing one-page partial English translation, both of which were directed to less material portions of the reference. The untranslated portions of the Japanese reference “contained a more complete combination of the elements claimed [in the patent] than anything else before the PTO.” 204 F.3d at 1376, 54 USPQ2d at 1005. The patentee, whose native language was Japanese, was held to have understood the materiality of the reference. “The duty of candor does not require that the applicant translate every foreign reference, but only that the applicant refrain from submitting partial translations and concise explanations that it knows will misdirect the examiner’s attention from the reference’s relevant teaching.” 204 F.3d at 1378, 54 USPQ2d at 1008. The term “national application” includes continuing applications (continuations, divisions, and continuations-in-part but not CPAs), so three months will be measured from the actual filing date of an application as opposed to the effective filing date of a continuing application. For international applications, the three months will be measured from the date of entry of the national stage. For international design applications, the three months will be measured from the date of publication of the international registration under Hague Agreement Article 10(3). Likewise, an information disclosure statement will be considered if it is filed later than three months after the application filing date but before the mailing date of a first Office action on the merits. An action on the merits means an action which treats the patentability of the claims in an application, as opposed to only formal or procedural requirements. An action on the merits would, for example, contain a rejection or indication of allowability of a claim or claims rather than just a restriction requirement (37 CFR 1.142) or just a requirement for additional fees to have a claim considered (37 CFR 1.16). Thus, if an application was filed on January 2 and the first Office action on the merits was not mailed until six months later on July 2, the examiner would be required to consider any proper information disclosure statement filed prior to July 2. These requirements are appropriate in view of the late stage of prosecution when the information is being submitted, i.e., after the examiner has reached a final determination on the patentability of the claims presented for examination. Payment of the fee (37 CFR 1.17(p)) and submission of the appropriate statement (37 CFR 1.97(e)) are the essential elements for having information considered at this advanced stage of prosecution, assuming the content requirements of 37 CFR 1.98 are satisfied. After the issue fee has been paid on an application, it is impractical for the Office to attempt to consider newly submitted information. Information disclosure statements filed after payment of the issue fee in an application will not be considered but will merely be placed in the application file. See MPEP § 609.05(b). The application may be withdrawn from issue at this point, pursuant to 37 CFR 1.313(c)(2) or 1.313(c)(3) so that the information can be considered in the application upon the filing of a RCE under 37 CFR 1.114 or in a continuing application filed under 37 CFR 1.53(b) (or 37 CFR 1.53(d) if the application is a design application). In this situation, a RCE, or a CPA (if the prior application is a design application), or a continuing application filed under 37 CFR 1.53(b) could be filed even though the issue fee had already been paid. See MPEP § 1308. Applicants are encouraged to file the petition under 37 CFR 1.313(c)(2) with a RCE, or the petition under 37 CFR 1.313(c)(3) with a CPA or continuing application under 37 CFR 1.53(b), by EFS-Web (see MPEP § 502.05) or facsimile transmission to the Office of Petitions (see MPEP § 502.01, subsection I.B. and § 1730 for the facsimile number). Alternatively, petitions to withdraw from issue may be hand-carried to the Office of Petitions (see MPEP § 502). The Office cannot ensure that any petition under 37 CFR 1.313(c) will be acted upon prior to the date of patent grant. Applicants considering filing a petition under 37 CFR 1.313(c) are encouraged to call the Office of Petitions to determine whether sufficient time remains before the patent issue date to consider and grant a petition under 37 CFR 1.313(c). If a petition under 37 CFR 1.313(c)(3) is being filed by facsimile transmission, the petition need not be accompanied by the information disclosure statement if the size of the statement makes its submission by facsimile impracticable, but the petition should indicate that an IDS will be filed in the continuing application if it does not accompany the petition under 37 CFR 1.313(c)(3). The IDS should be filed before the mailing of a first Office action on the merits. If a design CPA is being filed and the IDS cannot be filed within this time period, applicants may request a three-month suspension of action under 37 CFR 1.103(b) at the time of filing of the design CPA. See the discussion above in paragraph I.B. If a petition under 37 CFR 1.313(c)(2) is being filed, the RCE must be accompanied by a proper submission in order for the RCE to be in compliance with 37 CFR 1.114. Therefore, the IDS must accompany the RCE and the petition under 37 CFR 1.313(c)(2) if the IDS is the submission for the RCE. If an information disclosure statement includes a copy of a dated communication from a foreign patent office which clearly shows that the statement is being submitted within three months of the date on the communication, the copy of the dated communication from the foreign patent office by itself will not be accepted as the required statement under 37 CFR 1.97(e)(1) since it would not be clear from the dated communication whether the information in the IDS was “first cited” in any communication from a foreign patent office not more than three months prior to the filing of the IDS as required by 37 CFR 1.97(e)(1). The phrase “after making reasonable inquiry” makes it clear that the individual making the statement has a duty to make reasonable inquiry regarding the facts that are being stated. The statement can be made by a registered practitioner who represents a foreign client and who relies on statements made by the foreign client as to the date the information first became known. A registered practitioner who receives information from a client without being informed whether the information was known for more than three months, however, cannot make the statement under 37 CFR 1.97(e)(2) without making reasonable inquiry. For example, if an inventor gave a publication to the attorney prosecuting an application with the intent that it be cited to the Office, the attorney should inquire as to when that inventor became aware of the publication and should not submit a statement under 37 CFR 1.97(e)(2) to the Office until a satisfactory response is received. The statement can be based on present, good faith knowledge about when information became known without a search of files being made. Information disclosure statements will be reviewed for compliance with the requirements of 37 CFR 1.97 and 37 CFR 1.98 as discussed in MPEP § 609.04(a) and § 609.04(b). Applicant will be notified of compliance and noncompliance with the rules as discussed in MPEP § 609.05(a) and § 609.05(b). Pursuant to 37 CFR 1.97(i), submitted information, filed before the grant of a patent, which does not comply with 37 CFR 1.97 and 37 CFR 1.98 will be placed in the file, but will not be considered by the Office. Information submitted after the grant of a patent must comply with 37 CFR 1.501. If an information disclosure statement does not comply with the requirements based on the time of filing of the IDS as discussed in MPEP § 609.04(b), including the requirements for fees and/or statement under 37 CFR 1.97(e), the IDS will be placed in the application file, but none of the information will be considered by the examiner. The examiner may use form paragraph 6.49 which is reproduced below to inform applicant that the information has not been considered. Applicant may then file a new information disclosure statement or correct the deficiency in the previously filed IDS, but the date that the new IDS or correction is filed will be the date of the IDS for purposes of determining compliance with the requirements based on the time of filing of the IDS (37 CFR 1.97). The examiner should write “not considered” on an information disclosure statement where none of the information listed complies with the requirements, e.g., the format requirements of 37 CFR 1.98(a)(1) are not met. If none of the information listed on a PTO/SB/08A and 08B form is considered, a diagonal line should also be drawn across the form and the form made of record in the application file. The examiner will inform applicant that the information has not been considered and the reasons why by using form paragraphs 6.49 through 6.49.10. If the improper citation appears as part of another paper, e.g., an amendment, which may be properly entered and considered, the portion of the paper which is proper for consideration will be considered. If an item of information in an IDS fails to comply with all the requirements of 37 CFR 1.97 and 37 CFR 1.98, that item of information in the IDS will not be considered and a line should be drawn through the citation to show that it has not been considered. However, other items of information that do comply with all the requirements of 37 CFR 1.97 and 37 CFR 1.98 will be considered by the examiner. If information listed in the specification rather than in a separate paper, or if the other content requirements as discussed in MPEP § 609.04(a) are not complied with, the information need not be considered by the examiner, in which case, the examiner should notify applicant in the next Office action that the information has not been considered. The information disclosure statement filed  fails to comply with the provisions of 37 CFR 1.97, 1.98 and MPEP § 609 because . It has been placed in the application file, but the information referred to therein has not been considered as to the merits. 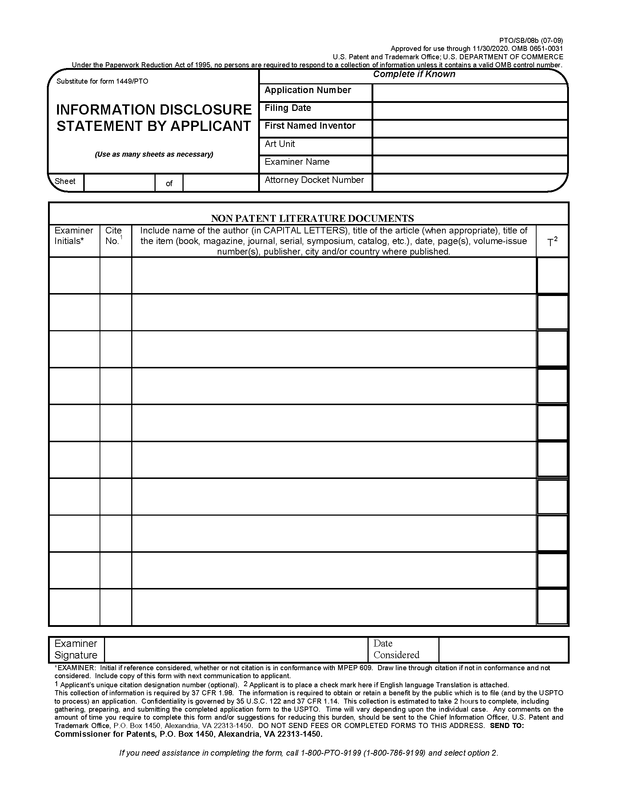 Applicant is advised that the date of any resubmission of any item of information contained in this information disclosure statement or the submission of any missing element(s) will be the date of submission for purposes of determining compliance with the requirements based on the time of filing the statement, including all requirements for statements under 37 CFR 1.97(e). See MPEP § 609.05(a). See MPEP § 609.05(a) for situations where the use of this form paragraph would be appropriate. The information disclosure statement filed  fails to comply with 37 CFR 1.97(c) because it lacks a statement as specified in 37 CFR 1.97(e). It has been placed in the application file, but the information referred to therein has not been considered. The information disclosure statement filed  fails to comply with 37 CFR 1.97(c) because it lacks the fee set forth in 37 CFR 1.17(p). It has been placed in the application file, but the information referred to therein has not been considered. The information disclosure statement filed  fails to comply with 37 CFR 1.97(d) because it lacks a statement as specified in 37 CFR 1.97(e). It has been placed in the application file, but the information referred to therein has not been considered. The information disclosure statement filed  fails to comply with 37 CFR 1.97(d) because it lacks the fee set forth in 37 CFR 1.17(p). It has been placed in the application file, but the information referred to therein has not been considered. The listing of references in the specification is not a proper information disclosure statement. 37 CFR 1.98(b) requires a list of all patents, publications, applications, or other information submitted for consideration by the Office, and MPEP § 609.04(a), subsection I. states, “the list may not be incorporated into the specification but must be submitted in a separate paper.” Therefore, unless the references have been cited by the examiner on form PTO-892, they have not been considered. The information disclosure statement filed  fails to comply with 37 CFR 1.98(a)(2), which requires a legible copy of each cited foreign patent document; each non-patent literature publication or that portion which caused it to be listed; and all other information or that portion which caused it to be listed. It has been placed in the application file, but the information referred to therein has not been considered. Do not use this form paragraph when the missing reference(s) are U.S. patents, U.S. patent application publications, or U.S. pending applications (limited to the specification, including claims, and drawings) stored in IFW. The information disclosure statement filed  fails to comply with 37 CFR 1.98(a)(1), which requires the following: (1) a list of all patents, publications, applications, or other information submitted for consideration by the Office; (2) U.S. patents and U.S. patent application publications listed in a section separately from citations of other documents; (3) the application number of the application in which the information disclosure statement is being submitted on each page of the list; (4) a column that provides a blank space next to each document to be considered, for the examiner’s initials; and (5) a heading that clearly indicates that the list is an information disclosure statement. The information disclosure statement has been placed in the application file, but the information referred to therein has not been considered. If an IDS listing includes a copy of an initialed IDS listing from another application, the IDS listing would not comply with the requirements under 37 CFR 1.98(a)(1). This form paragraph is applicable for such an IDS submission. The information disclosure statement filed  fails to comply with 37 CFR 1.98(a)(3)(i) because it does not include a concise explanation of the relevance, as it is presently understood by the individual designated in 37 CFR 1.56(c) most knowledgeable about the content of the information, of each reference listed that is not in the English language. It has been placed in the application file, but the information referred to therein has not been considered. The information disclosure statement filed  was submitted on an electronic medium that was not acceptable. It has been placed in the application file, but the information referred to therein has not been considered. Note that U.S. patents, U.S. application publications, foreign patent documents and non-patent literature cited in an information disclosure statement may be electronically submitted in compliance with the Office Electronic Filing System (EFS) requirements. This form paragraph may be used when the IDS that includes patents and non-patent literature documents is submitted on compact discs or any other electronic medium, except via EFS. Only tables, sequence listings, and program listings may be submitted on CDs. See 37 CFR 1.52(a) and (e). The information disclosure statement filed on  does not fully comply with the requirements of 37 CFR 1.98(b) because: . Since the submission appears to be bona fide, applicant is given ONE (1) MONTH from the date of this notice to supply the above-mentioned omissions or corrections in the information disclosure statement. NO EXTENSION OF THIS TIME LIMIT MAY BE GRANTED UNDER EITHER 37 CFR 1.136(a) OR (b). Failure to timely comply with this notice will result in the above-mentioned information disclosure statement being placed in the application file with the non-complying information not being considered. See 37 CFR 1.97(i). Use this form paragraph if an IDS complies with the timing requirements of 37 CFR 1.97 but part of the content requirements of 37 CFR 1.98(b) has been inadvertently omitted. This practice does not apply where there has been a deliberate omission of some necessary part of an Information Disclosure Statement or where the requirements based on the time of filing the statement, as set forth in 37 CFR 1.97, have not been complied with. The information contained in information disclosure statements which comply with both the content requirements of 37 CFR 1.98 and the requirements, based on the time of filing the statement, of 37 CFR 1.97 will be considered by the examiner. Consideration by the examiner of the information submitted in an IDS means that the examiner will consider the documents in the same manner as other documents in Office search files are considered by the examiner while conducting a search of the prior art in a proper field of search. The initials of the examiner placed adjacent to the citations on the PTO/SB/08A and 08B or its equivalent mean that the information has been considered by the examiner to the extent noted above. In addition, the following alternative electronic signature method may be used by examiners in information disclosure statements to indicate whether the information has been considered. Examiners will no longer initial each reference citation considered, but will continue to strikethrough each citation not considered. Each page of reference citations will be stamped by the examiner with the phrase “All references considered except where lined through” along with the examiner’s electronic initials, and the final page of reference citations will include the examiner’s electronic signature. Examiners must consider all citations submitted in conformance with the rules, and their initials when placed adjacent to the considered citations on the list or in the boxes provided on a form PTO/SB/08A and 08B (or the examiner may use the alternative electronic signature method noted above)provides a clear record of which citations have been considered by the Office. The examiner must also fill in his or her name and the date the information was considered in blocks at the bottom of the PTO/SB/08A and 08B form. If any of the citations are considered, a copy of the submitted list, form PTO/SB/08A and 08B, as reviewed by the examiner, will be returned to the applicant with the next communication. Those citations not considered by the examiner will have a line drawn through the citation. The original copy of the list, form PTO/SB/08A and 08B will be entered into the application file. The copy returned to applicant will serve both as acknowledgement of receipt of the information disclosure statement and as an indication as to which references were considered by the examiner. Forms PTO-326 and PTOL-37 include a box to indicate the attachment of form PTO/SB/08A and 08B. Information which complies with requirements as discussed in this section but which is in a non-English language will be considered in view of the concise explanation submitted (see MPEP § 609.04(a), subsection III.) and insofar as it is understood on its face, e.g., drawings, chemical formulas, in the same manner that non-English language information in Office search files is considered by examiners in conducting searches. The examiner need not have the information translated unless it appears to be necessary to do so. The examiner will indicate that the non-English language information has been considered in the same manner as consideration is indicated for information submitted in English. The examiner should not require that a translation be filed by applicant. The examiner should not make any comment such as that the non-English language information has only been considered to the extent understood, since this fact is inherent. See Semiconductor Energy Laboratory Co. v. Samsung Electronics Co., 204 F.3d 1368, 1377-78, 54 USPQ2d 1001, 1008 (Fed. Cir. 2000) (“[A]s MPEP Section 609C(2) reveals, the examiner’s understanding of a foreign reference is generally limited to that which he or she can glean from the applicant’s concise statement…Consequently, while the examiner’s initials require that we presume that he or she considered the [foreign] reference, this presumption extends only to the examiner’s consideration of the brief translated portion and the concise statement.”). If an item of information in an IDS fails to comply with requirements of 37 CFR 1.97 and 37 CFR 1.98, a line should be drawn through the citation to show that it has not been considered. The other items of information listed that do comply with the requirements of 37 CFR 1.97 and 37 CFR 1.98 will be considered by the examiner and will be appropriately initialed. Occasionally, documents are submitted and relied on by an applicant when replying to an Office action. These documents may be relied on by an applicant, for example, to show that an element recited in the claim is operative or that a term used in the claim has a recognized meaning in the art. Documents may be in any form but are typically in the form of an affidavit, declaration, patent, or printed publication. To the extent that a document is submitted as evidence directed to an issue of patentability raised in an Office action, and the evidence is timely presented, applicant need not satisfy the requirements of 37 CFR 1.97 and 37 CFR 1.98 in order to have the examiner consider the information contained in the document relied on by applicant. In other words, compliance with the information disclosure rules is not a threshold requirement to have information considered when submitted by applicant to support an argument being made in a reply to an Office action. However, consideration by the examiner of the document submitted as evidence directed to an issue of patentability raised in the Office action is limited to the portion of the document relied upon as rebuttal evidence; the entirety of the document may not necessarily be considered by the examiner. At the same time, the document supplied and relied on by applicant as evidence need not be processed as an item of information that was cited in an information disclosure statement. The record should reflect whether the evidence was considered, but listing on a form (e.g., PTO-892, or PTO/SB/08A and 08B) and appropriate marking of the form by the examiner is not required. For example, if applicant submits and relies on three patents as evidence in reply to the first Office action and also lists those patents on a PTO/SB/08A and 08B along with two journal articles, but does not file a statement under 37 CFR 1.97(e) or the fee set forth in 37 CFR 1.17(p), it would be appropriate for the examiner to indicate that the teachings relied on by applicant in the three patents have been considered, but to line through the citation of all five documents on the PTO/SB/08A and 08B and to inform applicant that the information disclosure statement did not comply with 37 CFR 1.97(c). A citation listed on form PTO/SB/08A and 08B and considered by the examiner will be printed on the patent. A citation listed in a separate paper, equivalent to but not on form PTO/SB/08A and 08B, and considered by the examiner will be printed on the patent if the list lends itself to easy capture of the necessary information by the Office printing contractor, i.e., each item of information is listed on a single line, the lines are at least double-spaced from each other, and the information is uniform in format for each listed item. For patents printed after January 1, 2001, citations from information disclosure statements that are printed on the face of the patent will be distinguished from citations cited by the examiner on a form PTO-892. The citations cited by the examiner on a form PTO-892 will be marked with an asterisk. If an item of information is cited more than once in an IDS and on a form PTO-892, the citation of the item will be listed only once on the patent as a citation cited by the examiner. If the applicant does not provide classification information for a citation, or if the examiner lines through incorrect classification data, the citation will be printed on the face of the patent without the classification information. If a U.S. patent application number is listed on a PTO/SB/08A and 08B form or its equivalent and the examiner considers the information and initials the form, the application number will be printed on the patent. Applicants may wish to list U.S. patent application numbers on other than a form PTO/SB/08A and 08B format to avoid the application numbers of pending applications being published on the patent. If a citation is not printed on the patent but has been considered by the examiner, the patented file will reflect that fact as noted in MPEP § 609.05(b). If the e-IDS complies with the requirements of 37 CFR 1.97, examiners must consider the e-IDS and complete the e-IDS form by initialing, signing, and dating the e-IDS form entries. See MPEP § 609.05(b). Examiners may notice numbering gaps in the “Citation No.” column on the printed e-IDS form due to an applicant data entry error. This data entry error will not affect the e-IDS and is not a sufficient reason not to consider the e-IDS. A copy of the initialed e-IDS form must be sent to the applicant. The completed copy of the e-IDS form sent to an applicant should be made of record in the official file when the copy is sent to the applicant. As of January 18, 2006, the Office began electronic processing of the list of citations (e.g., form PTO/SB/08) submitted as part of an information disclosure statement (IDS) submitted in applications stored by the Office in image form. Examiners are provided with a tool to electronically annotate citations and electronically sign the IDS when reviewing the cited references. See MPEP § 609.04(b) for determining whether a cited reference has been considered by the examiner. The electronically processed IDS will be stored in the Office’s official record as an entry in the application’s image file wrapper (IFW) and a copy will be mailed to applicant as part of an Office action.